You’ve probably heard that the only safe place around a camel is on its back. 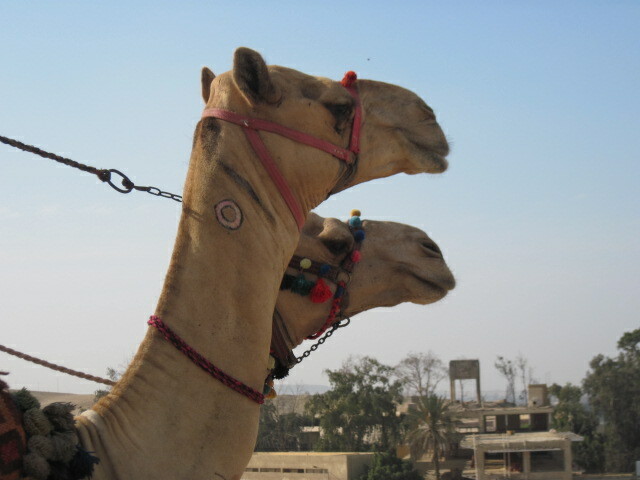 If you haven’t, you have now, even if there is no such thing as a two headed camel. But why? Did you know they can spit (with gusto) for 37 meters? That’s over 120 feet! Most people say it’s their defense mechanism. I’m sorry—I did not offend him, nor did I see fear in that camel’s eyes, only disdain. He spit at me 30 feet away because he could. Much of the time when we are faced with a threat to our children or ourselves, we have a similar reaction as that of the camel—not the spitting, just the defense mechanism. On CNN Anderson Cooper’s AC-360 program, Dr. Gail Saltz, a contributing psychiatrist on the program outlined some of the manifestations of stress in family life http://bit.ly/MY8HEk. In the current hectic, financially distraught economy, impending job loss, financial ruin, and the stress of raising a family when the future is uncertain, all push us a little closer to the edge. Living without fear of losing our livelihoods is a luxury enjoyed by fewer and fewer people each day. We don’t chose to live on the brink of disaster, but we may find ourselves there. The result of these conditions should not be surprising, and is a bit more destructive than the way the camel deals with a perceived threat. It is not uncommon for people under stress to suffer from anxiety and depression—no surprise. But the idea of whether or not life is even worth living may begin to push it’s way into our thoughts. To make matters worse, men have an inner voice—an instinct telling them they must provide for their families no matter what. When the situation is critical, they differ from women in the way they perceive that emotion. Many men with families may begin to think that their wives and children would benefit more from their life insurance policy than their presence. Satan would love to make us so desperate we’re willing to take desperate measures to protect our families. But the thought of ending our lives is not the only way he pushes us. Violence has increased in the U.S. exponentially in the past two years. The result? This activity differs from depression in that the individual drops out of the work force, but not society. He/she is not depressed—they’re just done. It doesn’t mean they don’t need to earn an income—it may financially devastate their families, so it is not rational. Since the problems we are facing are not likely to disappear in the near future, it’s important to find constructive ways of dealing with stress and threats. Eat healthy—No, seriously. This is a no-brainer in one sense, but most people under stress eat more comfort foods that take their toll by robbing us of sleep and zapping our energy. It contributes significantly to depression, and should be taken seriously. Exercise—this is harder than most of the other items here. We don’t fell like exercising when the world is crashing in. But studies performed by Dr. Melissa Stöppler http://bit.ly/LnJ5yG shows that exercise is a key, central method to deal with stressors and depression. Get plenty of sleep—this can be frustrating, because when stress and fatigue are at a heightened level, we’re tired but can’t sleep. Our minds keep racing and trying to figure out what we need to be doing to resolve the issues. Exercise helps this too, but usually sleeping pills are not a good plan. They can make you sleep without the REM (rapid eye movement) rest that you need. Give yourself a break—don’t be too hard on yourself. You are under a lot of stress, and your best is all you can do. You may think, “but my best is not enough.” Yes it is. If you really are doing your best, God will honor that. Gentlemen remember—your family needs you … alive. You are more valuable to them with no income at all, than a million-dollar life insurance policy and an empty chair at the dinner table. You may feel desperate—but God is faithful. He has not, and will not abandon you. That isn’t my promise—it’s His.